Do not miss out on the evolution of glade-park.com! We are a work in progress, and whether your interest is past history and/or present community life, know when to come back for another look! The blog is frequently a link to the latest addition to the website, a community event, changes to an existing page, or introduction of a new page. LEARN HOW TO KEEP YOUR EAR TO THE GROUND! Look for the box on the left at the bottom of the navigation column that says Subscribe To This Site, and pick the way you want to receive your updates. If you want to learn about how to subscribe, click on: ? Family friendly movies under a cool blanket of stars, with FOOD and pre-show entertainment.. Benefits Glade Park Volunteer Fire Department. 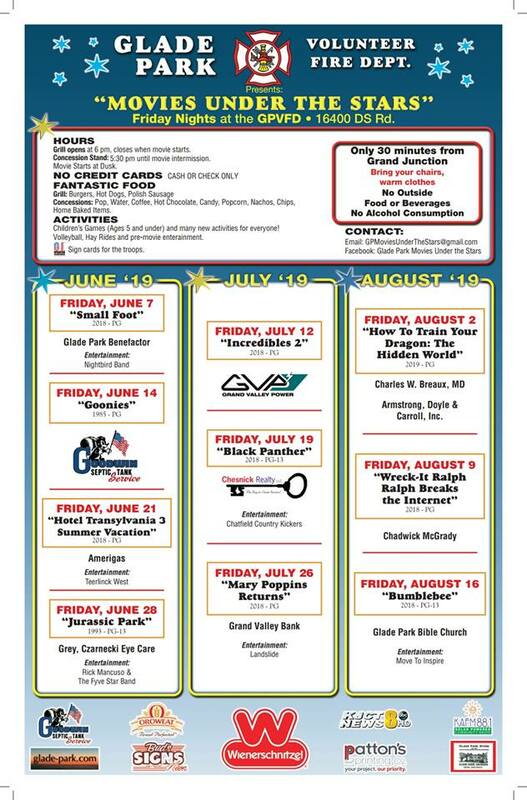 Continue reading "Glade Park Volunteer Fire Department Movies Under the Stars"
Continue reading "National Rhyne Reunion"
Good times, good causes, the meaning of community! 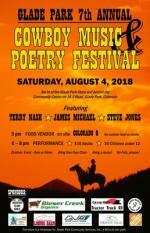 Continue reading "Glade Park Community Events Calendar "
Continue reading "Glade Park Community Days"
Continue reading "Kudos to Glade Park Movies Under the Stars"
Continue reading "2018 Glade Park Cowboy Music & Poetry Festival"
Glade Park Community Services - the heart and hands of the community. 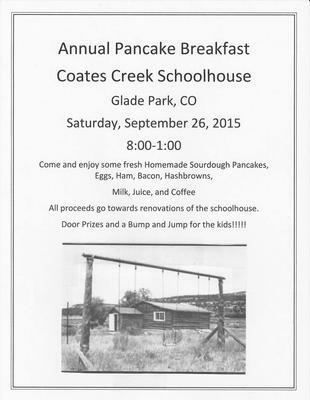 Continue reading "Glade Park Community Services, Inc."
Continue reading "7th Annual Glade Park Cowboy Music & Poetry Festival"
Coates Creek School Cookbook: old family recipes to preserve a historic one room schoolhouse. Continue reading "Coates Creek School Cookbook"
Continue reading "In Memory of Mary Jane Forrester"
Continue reading "Maudie Mosher Memorial Service"
Continue reading "Volunteer Day at Steadfast Steeds"
Continue reading "Questions about Adin Terrill Family"
Continue reading "Bear Problem at Fruita Reservoir #39"
Body Recovered from Enochs Lake - name not released. Continue reading "Body Recovered from Enochs Lake - name not released." How to help the Markham family whose home burned. Continue reading "How to help the Markham family whose home burned. " 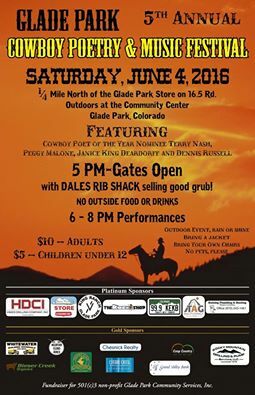 Continue reading "2017 GLADE PARK COWBOY POETRY FESTIVAL"
GLADE PARK COMMUNITY-WIDE MEETING on Wednesday, May 10th, 2017 at 6:00 p.m.
Continue reading "GLADE PARK COMMUNITY-WIDE MEETING on Wednesday, May 10th, 2017 at 6:00 p.m."
Continue reading "Sage Grouse: "Species of Concern" or Wild Poultry Prankster?" Continue reading "2017 Glade Park Pipeline Water Users Assoc. Annual Meeting "
Continue reading "Fellowship of Christian Athletes Speaker at Glade Park Church"
General Public welcome to shop! Only Glade Park residents can sell. Table can be purchased upon arrival for $2. Glade Park Bible Church will provide free hot dogs as long as they last, and are also doing the event advertising. Continue reading "Glade Park Community Yard Sale"
Continue reading "Glade Park Local Wisdom"
Glade Park 4-H builds character and good times. Continue reading "Glade Park Rangers 4-H Club"
Continue reading "Glade Park Easter Egg Hunt - April 15, 2017"
New Glade Park Rangers 4H Club! Continue reading "New Glade Park Rangers 4H Club!" Glade Park Post Office Needs Youi! Continue reading "Glade Park Post Office Needs Youi!" GladePark.com is now mobile adapted! Don't ask why it took so long, just enjoy GladePark.com finally being mobilized! It should be much easier to navigate and enjoy on your mobile device. Let me if you run into any snags! 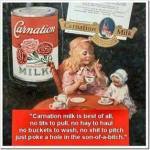 Continue reading "Glade Park Old Timers Review of Canned Milk"
Commerce by and/or for Glade Parkers! 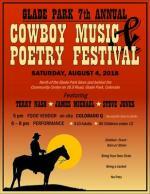 Continue reading "Glade Park Marketplace"
Continue reading "Debra Pace - Cherry Creek Mortgage"
Continue reading "Thank you to Pastor Paul "
Continue reading "2016 Glade Park Cowboy Poetry & Music Festival"
Annual GPCS Pancake Breakfast and Community Clean up! Continue reading "Annual GPCS Pancake Breakfast and Community Clean up!" Continue reading "RIP Ralph G. "Pauly" Lawson "
Claude M Mabie descendant reaching out! Continue reading "Claude M Mabie descendant reaching out!" Continue reading "Great Western Heritage Show"
Continue reading "Glade Park Bible Church pastor hours"
Continue reading "Glade Park Bible Church"
Continue reading "GPCS 2015 Christmas Party! Date change!" 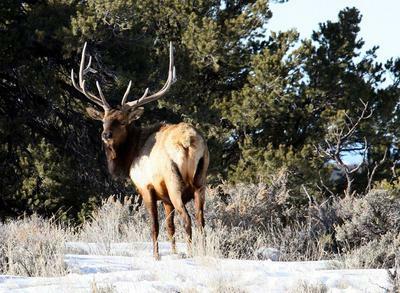 We'll never forget the first time we saw an elk! 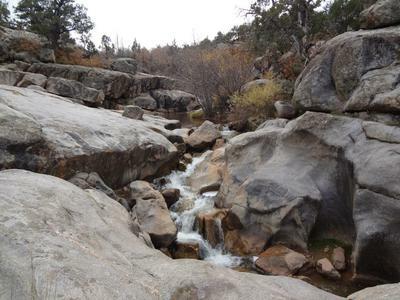 Continue reading "Wildlife of Glade Park, CO"
Continue reading "More Memories of Glade Park, CO"
Kathy's Creations: Sewing, mending and More! Custom Sewing, Designs & Alterations. You need it, I can do it. About 40 years experience. If you can't get to me, just call and I'll come to you. Continue reading "Kathy's Creations: Sewing, mending and More!" 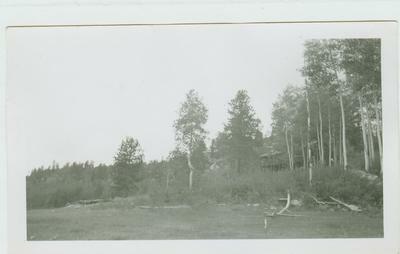 Continue reading "Lodge at Enoch's Lake circa 1955"
Continue reading "Kathy's Creations / Sewing, Mending, Designs / Alterations....."
Continue reading "Alterations / Custom sewing"
Continue reading "2015 Coates Creek School Pancake Breakfast"